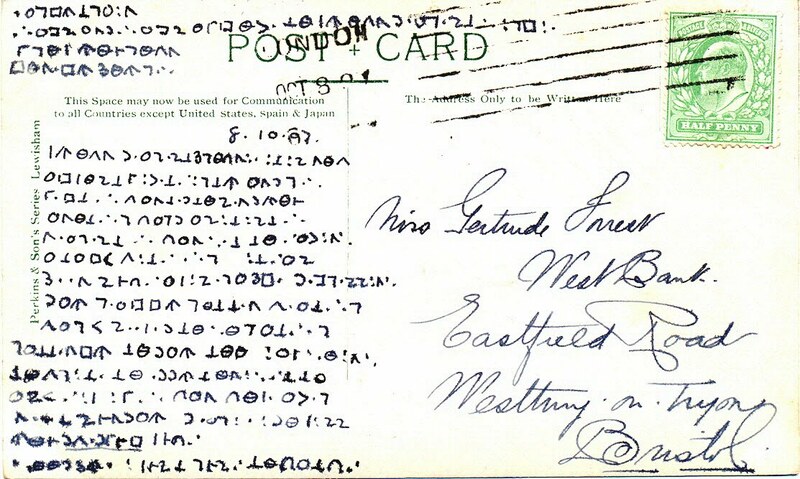 In her comment last week, About Postcards said she enjoyed cracking coded messages. I love doing this too. In fact, one way or another, all of my favourite cards are written in secret languages. I'm not sure exactly why this is. But I reckon it's got something to do a concept JJ Abrams (creator of Lost) calls "the mystery box". When you have a moment, have a look at a seminar Abrams gave on storytelling - link is below. He talks about being drawn to things which have "infinite possibilities" and uses the example of a box of magic tricks he is fascinated by because it's never been opened. 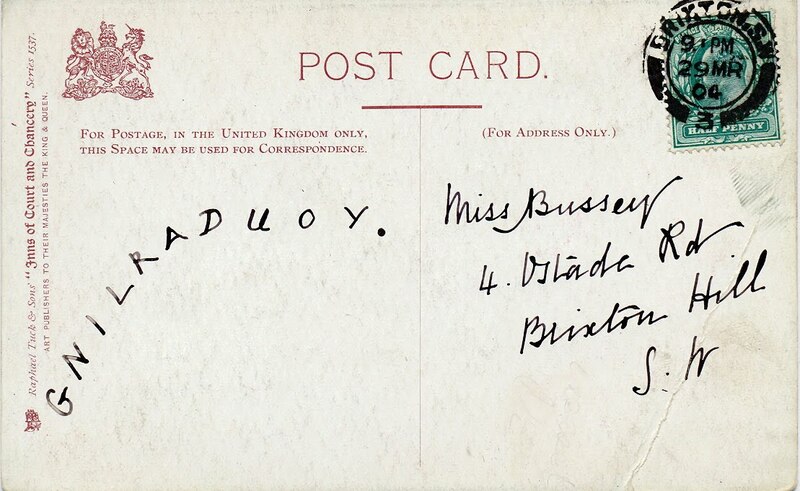 I find postcard messages offer a similar means for firing imaginations. They might be a bit pedestrian, especially compared to special-effect-driven adventures on desert islands, but mysteries are there to be enjoyed. And with coded messages you get double your intrigue. The code presents the obvious challenge, working out the words the author wanted to hide from the postman. But even when you've deciphered the message you're still only left with one moment, one piece of a dialogue. The before and the after remain hidden. So, to this week's cards. I've put two up. 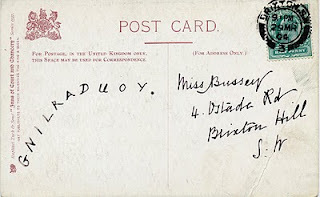 The card in block capitals is at the Easy end of the code spectrum. Brace yourself for the message to Miss Gertrud. It is Super Fiendish and I'm afraid I have no answers. The mystery box it seems remains firmly sealed. Any ideas? Wonderful postcard backs! Now I wonder what they say???? I wonder whether it is a common code. I got the You Darling .... This is fun! Happy PFF! 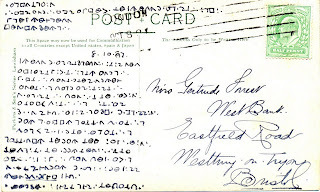 For the Getrud card Linda (from About Postcards) thinks the sender has used some kind of masonic cipher. With a bit of help from Google, I think we can crack it! Just need a spare day or so... Any takers? Snap - there is no fooling you :-) ! Good to hear from you again! The solution was found by the German computer specialist and codebreaker Armin Krauss.